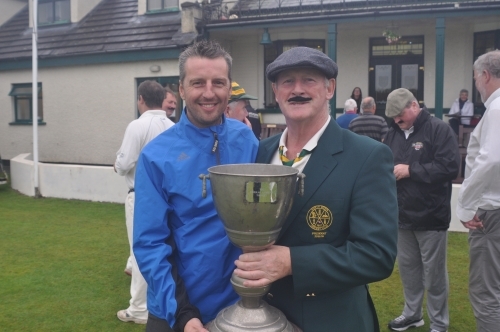 For the first time in its history the Annual Titanic cricket match to commemorate the North Down Cricket Club connection with the Belfast Shipyard and in particular with the Harland and Wolff Chief Designer Thomas Andrews (Jun), was reduced to a Bowl Out. 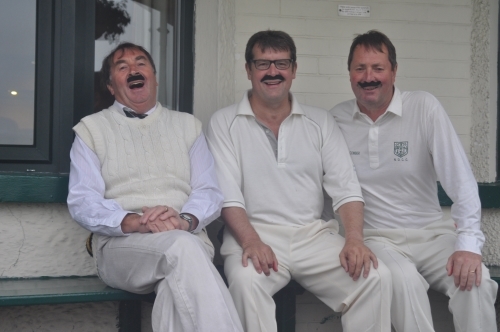 Heavy rain prevented the 20-overs game from taking place, but a Bowl-Out in front of the clubhouse followed by a BBQ and refreshments ensured a unique heritage was preserved for another year. North Down won the shoot-out 2-1 thanks to late strikes from Ian Shields and Michael Quinn and NCU President Billy Boyd made the presentation to North Down skipper Clarence Hiles, who organized the match. Stephen Hughes captained the Shipyard team and despite several late cry-offs his team included well-known Golden Oldies Davy Napier, Paul Jackson, Chris Harte and Alan McMillan. The motley array of players on both teams entered into the spirit of the occasion with moustaches for the unbearded players, much as they were over 120 years ago when this fixture was first played. Tommie Andrews played cricket and hockey at North Down and was a Vice-President of the NCU and would surely have been President had fate not dealt the world’s most famous ship such a cruel end in 1912. The club has tastefully preserved Tommie’s place in history and kept a close connection with the Belfast Titanic Society through Brian Patterson. Club historian Ian Shields and Brian got together in 2007 to resurrect the match and Brian presented a huge trophy for the annual game although the match has remained more social than sporting down the years. The Society members have played an important part in preserving the tradition with their popular BBQ and this year several of them entered into the spirit of the occasion by attending in period dress. Many of the players did likewise and this is a feature that will continue next year when hopefully the weather is kinder.